Beliggende i den fredelige boligområder landsby Exo Gonia er Cavern House Anthea ideelt placeret for at udforske Santorini med strandene i Kamari og øens hovedstad Fira både inden for blot 15 minutters kørsel. Den prisbelønnede taverna Metaximas er blot få minutters gang fra døren og den nærliggende landsby Pyrgos tilbyder et udvalg af butikker og faciliteter. Skåret fra vulkansk sten, denne traditionelle Santorinian hjem består af 3 soveværelser med dobbeltsenge, 2 badeværelser (heraf 1 med et stort træk sten badekar) og en stor åben planløsning, der inkorporerer både en spiseplads og en lounge. Anthea er uden plads omfatter en gård med spiseplads og en stor solterrasse, som har en spa pool og hængekøje. Cavern House Anthea tilbyder panoramaudsigt til vin terrasser af Profitis Ilias og på tværs af Ægæerhavet til øen Anafi, mens gården og grillplads giver skyggefulde plads til spisning og underholdende. 24 timer lufthavnstransport og wifi er inkluderet. We are a family of six and had been dreaming about this travel for a long time, but the outcome definitely exceeded our expectations. The house is a traditional one: stunningly nice and comfortable and very spacious as well. Every room is equipped with A/C, which is sometimes life-saving as it tends to get humid at night. The housekeeper is super kind and helped us plan our activities for the whole week, always being at disposal for any need we might have had (plus he brings in fresh and tasty bread daily). The view from the balcony is beautiful and at sunset you basically get to see a postcard right before your eyes while chilling on the hammock or on the sofas. The property's position is strategic as it's located right in the middle of the island and every interesting spot can be easily reached by car, though you can even walk to the tourist centre through hiking paths that start 0.5 miles away from the villa (that will keep you in shape). The description perfectly matches with the equipment as nothing misses and the Wi-Fi works well around the house (except for the balcony). The pool has the perfect size for relaxing with a drink, but won't suit you if you are looking for one to actually swim inside. Also the owner is very helpful, providing the info you may need and answering all the questions you pose. All told, this is an absolutely recommendable and beautiful property and hopefully we will be soon back at it. Absolutely wonderful. The property is spacious and very comfortable. We were 2 couples for a week.Plenty of amenities: BBQ in a gorgeous courtyard, AC in the bedrooms, full kitchen, washer No dryer but they dry outside in 10 minutes.Centrally located so close to supermarkets,beaches. Nearby restaurant is excellent (we ate there twice). Pool area is great for lounging particularly at night gazing at a sky full of stars. Property Manager Panos took great care of us bringing fresh bread to us every morning. Overall a 5 star property and would only stay here when we return to beautiful Santorini. Tips : rent a car to get around it’s easier and cheaper than taxis. Buy lots of bottled water. Visit Oia for the insane sunsets but be prepared for the crowds. Eat everything it was all great. 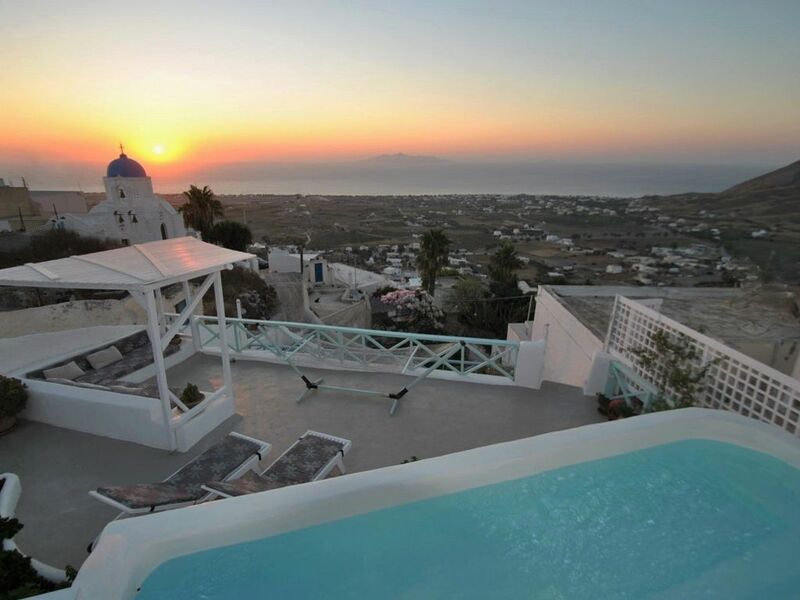 It was my brothers Wedding week in Santorini and Myself and 5 family and friends shared this villa for 7 nights on June 9th. A driver picked us up from the airport in a minibus and took us to the villa, Panos was there waiting to welcome us in. He gave us a chat about things to do on the island etc. The villa is simply amazing and is a perfect layout, all the 3 bedrooms are a nice distant away from eachother too which is better for couples sharing. The kitchen is fully equipped for those nights you decide to eat in. The pool area is just up a slight hill (on top of the villa basically) but it is worth the 20 second climb each and every time, the views from up there are absolutely unreal, you’ll find most of your mornings and late afternoons spent relaxing up there for sure! All in all it was an incredible week, Santorini is one of the nicest places I’ve ever been to, it’s definitely worth renting a car to get around the island, we got cars in Kamari for about 25 euros a day! Wow what a beautiful Island. It is just how it looks in the pictures. Our family occupied both property's & wasn't disappointed. The view is stunning and our host couldn't do more for us. Once you are familiar with the area everything is easy to get to. Our Cavern house was clean & well equipped with a lovely welcome pack , Tea , coffee , water , fresh bread every day aswel as ham cheese jam butter, milk & fresh fruit ! We came as a family for a Wedding which was stunning! Would definitely go back to The Anthea House again. We had such a fabulous holiday, a huge thank you to Panos for taking great care of us, he really does go above and beyond and nothing is too much trouble. Would highly recommend this property, spacious and comfortable, just be aware the swimming pool/ deck area is separate to the main house, great if you have children as they can’t go up by themselves and fantastic views from the pool area. Exo Gonia is a small village & the local restaurant has excellent food, would definitely recommend a car to explore Santorini as taxis/ transfers can be pricey but this is a great location to position yourself to explore the island. Thanks again, would love to come back one day! We stayed in this cave house March 2018. It was clean, tidy and the right suze for 6 people. The location was great - not far from the main tourist sites, but feels fairly local. The house Has a well equity kitchen and is cool at night (cave house so few windows). The host greeted us every morning and was extremely helpful. Great value for money. Note a hire car (or ATV) is a must. Self catering villa; pool; havudsigt; stille traditionelle hulhus i landsbyen Exo Gonia.